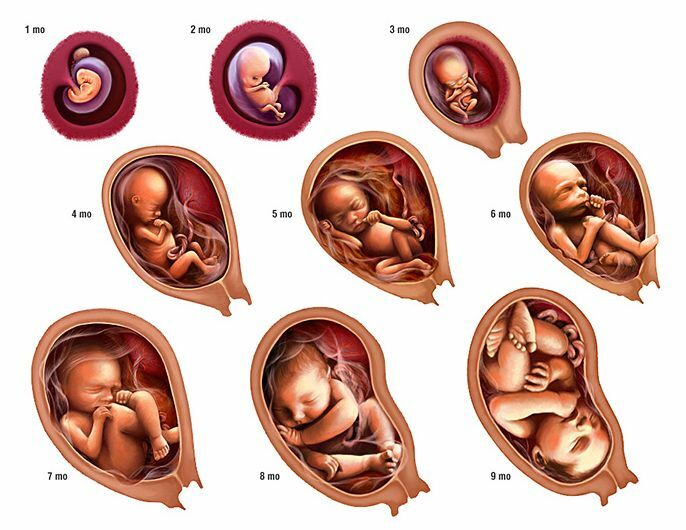 At the beginning of the ninth week of development, the developing offspring has a distinctively human appearance and is now referred to as a fetus. At the start of the fetal stage, the head is as large as the body and all rudimentary organs are present. The ossification of bones begins during weeks nine through twelve and organs continue to develop. By the twelfth week, the fetus weighs about 45 grams and is about the size of a candy bar. During the thirteenth through sixteenth weeks, the eyes and ears reach their final positions and a heartbeat may be detected with a stethoscope. During the seventeenth through twentieth weeks, fine hair (lanugo) covers the body and hair appears on the scalp. Sebum from sebaceous glands and dead epidermal cells form the vernix caseosa, which protects the skin from the digestive and urinary wastes in the surrounding amniotic fluid. Movements of the fetus may now be detectable by the mother. By the end of the twentieth week, the fetus weighs about 460 grams, or approximately one pound. Continued growth of organ systems during the twenty-first through twenty-ninth weeks enables the head, body, and limbs to attain infant proportions. However, the fetus is still lean, with wrinkled, rather translucent skin. By the twenty-ninth week, the fetus weighs about 1,300 grams, or approximately 3 pounds. Deposition of adipose tissue in the subcutaneous tis sue plus continued growth and development of organ systems, as well as the descent of the testes in males, occur in the eighth and ninth months. By the time the fetus is full term, the lanugo has been shed, the skin is pinkish with ample subcutaneous tissue, hair covers the scalp, and all organ systems are ready for birth. The fetus weighs about 3,400 grams or about 7.5 pounds.